Merry has completed the Wonder Child challenge, quite successfully I might add. I am very proud of her score of 797. I doubt I will do this challenge again as she is my Gold medal winner and I don’t know that I can top that or even want to try. I have already uploaded Merry at the moment of her aging up to my library and she is available in the gallery – if you are reading this. Now it is time to move on to something else. 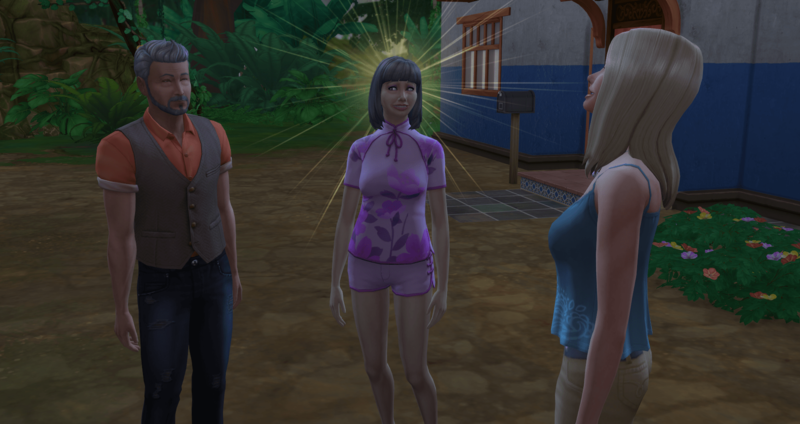 I have already decided that Merry will be the matriarch in a 100 Baby Challenge and that is what we (she and I) will be starting next. Merry still has a life to live with her parents that I would like to share with you. This is the life she would have gotten to live in another reality. After her birthday, Merry realizes that she is free. Free from the studying, the constant learning, the need to become all that she can be. Free to do what she wants. And she realizes that her parents are getting older. Old, in fact. They don’t have much longer to live in this world and she needs to spend time with them now while she can. 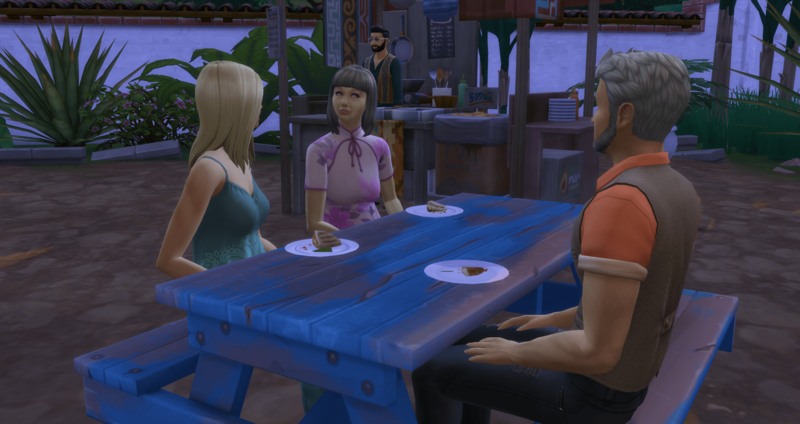 She plans a trip to Selvadorada and they all pack their bags and leave immediately. 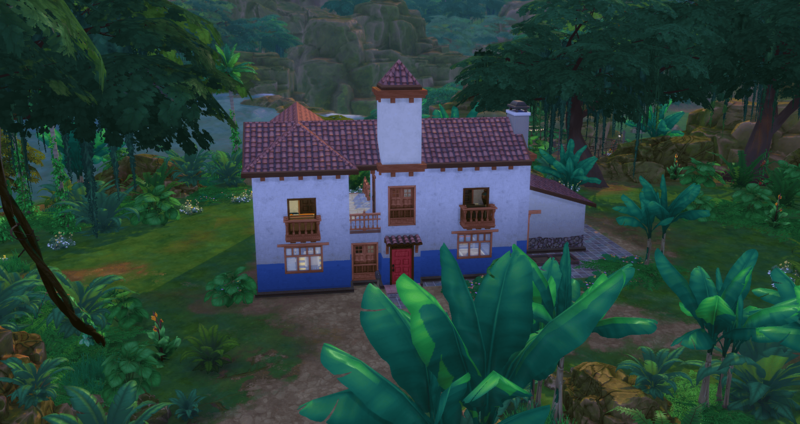 They rent a nice villa, Selvadorada Villa, near the village center. They visit the local marketplace and take in the sights. There is the Statue of Madre Cosecha standing in the middle of the village, which they stop to view. They enjoy eating the local food. Merry has the Arepa Rellena con Perico, Portia has the Arepa de Pabellon, and Castor has the Empanadas de Verde. Yum. 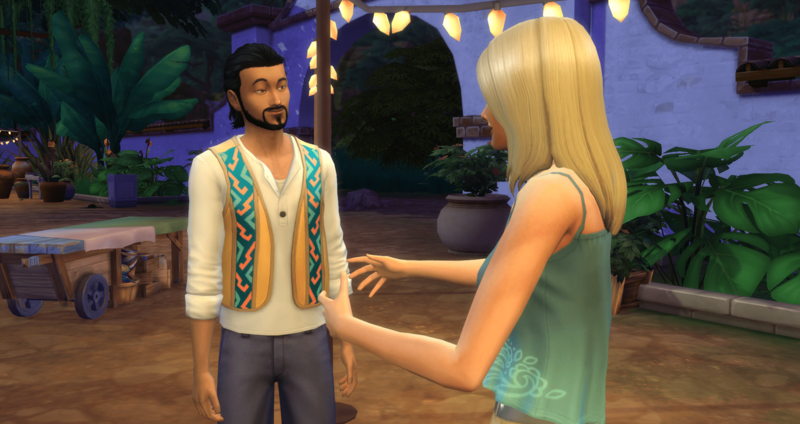 Merry talks to the locals and learns about Selvadoradian culture. She even finds out about the secret menus and secret wares that she can buy. 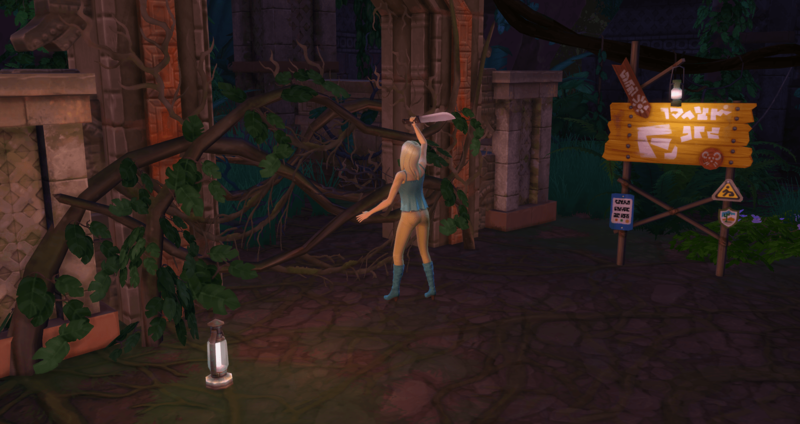 While Portia and Castor take it easy at the villa, Merry explore the deep jungle and finds several hidden areas off the beaten path. She even finds the old tattered knapsack from a previous adventurer. 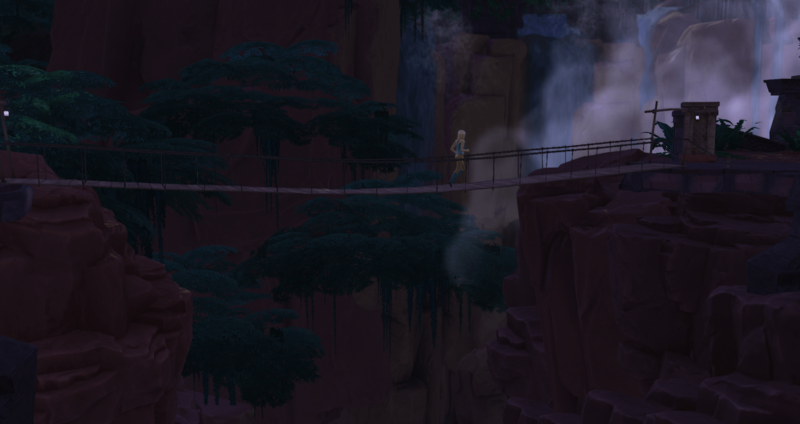 She crosses a long rope bridge over a deep chasm. And finds a very romantic scenic waterfall. If only she were not here alone as it is so beautiful it is really making her feel flirty. It is a good thing that she bought and brought some extra machetes because she is losing them left and right. Merry stumbles and drops her bag and has to use one of her extra machetes to grab the bag. While blazing a trail in the jungle, Merry comes across a small group of capybaras hanging out by a watering hole. As she observes them, she notices one of them is approaching a huge swarm of bees. She decides to scare of the bees to try to save the capybara using her high fitness skill. She jumps up and down waving her arms, trying to catch the bees attention. The bee swarms heads towards her and she runs chaotically until the bees are thoroughly confused. As Merry stops, she realizes she is standing on ancient treasure. Score! She just found a Surfer Hematite Gold Perereca – basically a really expensive solid gold frog. 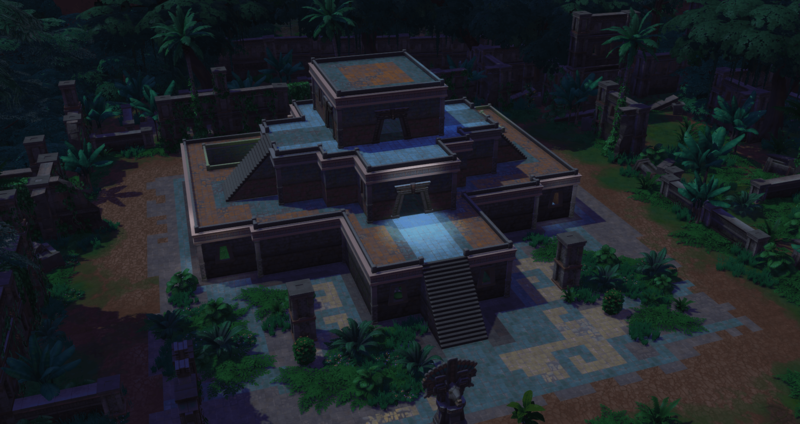 She even finds a hidden temple, the Temple of Abundance. 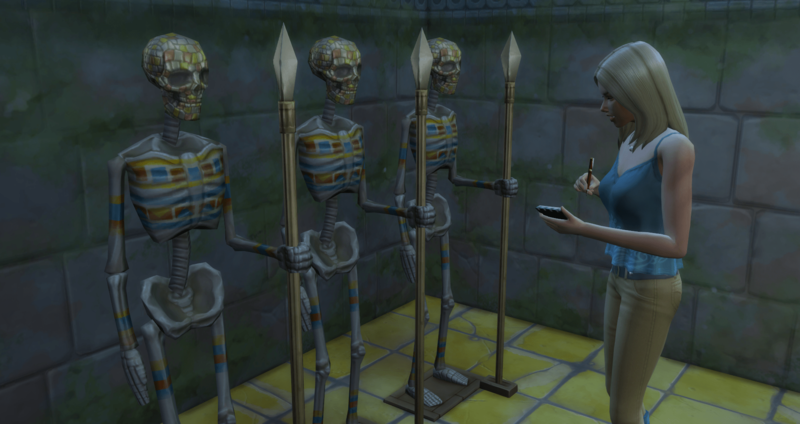 Now to see if she can find her way into the hidden chambers of the temple. She examines the traps for the first entrance, the second entrance, the third entrance, and the fourth entrance and finally makes her way into the hidden chambers. 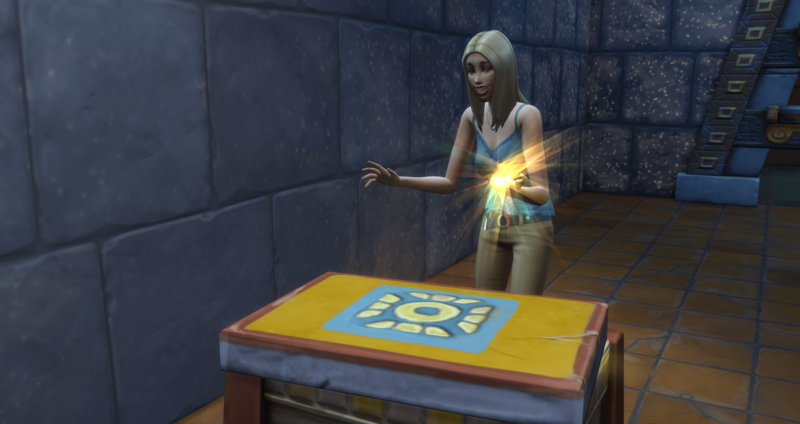 She finds treasure and is taking it home. 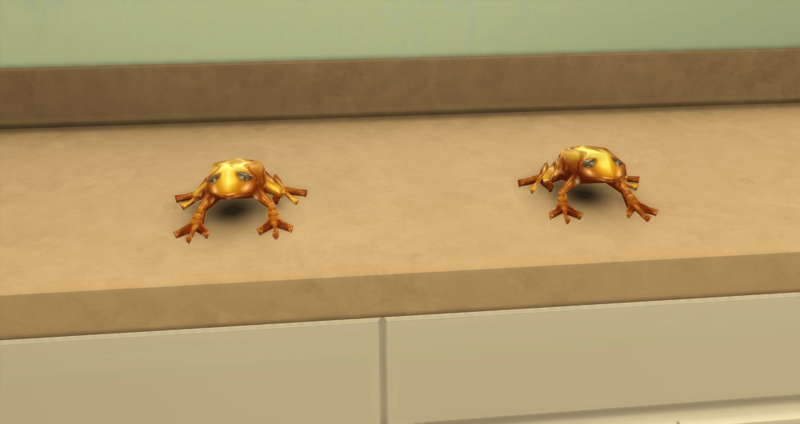 It is a second Surfer Hematite Gold Perereca (solid gold frog). Because Merry successfully bypassed the temple defenses, she received the Blessing of the Ancients. Now she is passing it on to those she is around. 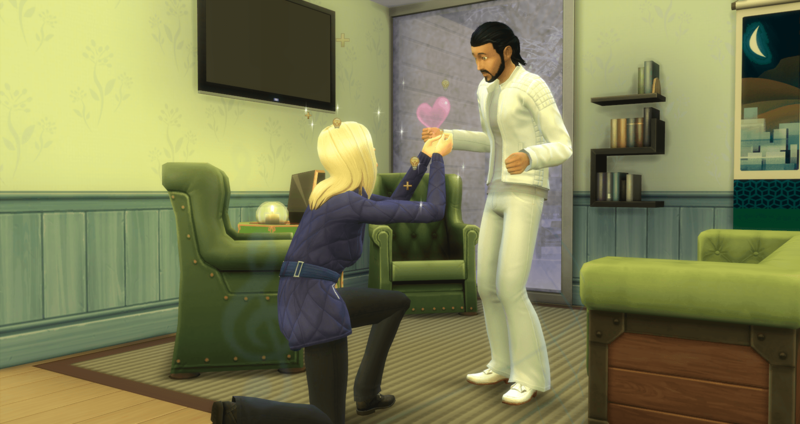 Castor and Portia have both received the Blessing. It is a 2-day +2 Happy boost. After spending several days in the jungle, they come home happy. Happy to have had the time together as a family, and happy to be home. And it is snowing. Winter has come. Having arrived home from their vacation, it is time for Merry to do the adult thing and get a job. Since this is an alternate reality, she takes the job she was meant to have – she takes a job in the Entertainer career. Since she had an A in high school and was a Service Cashier (level 3 Fast Food) in her teen career, she begins her adult career as an C-Lister, level 3. 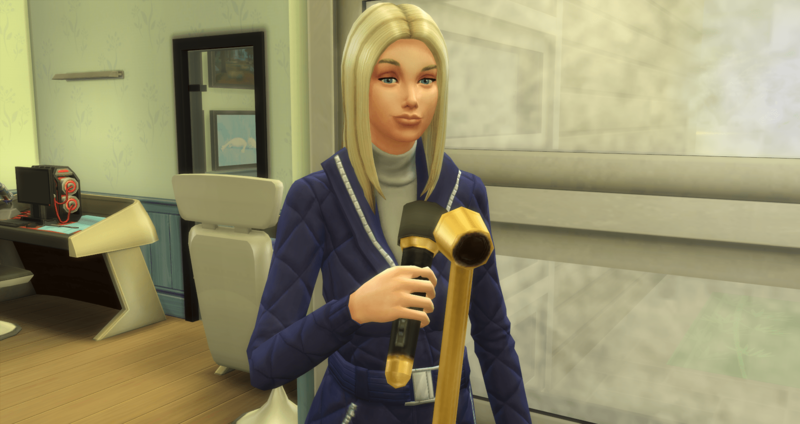 She only needs two promotions to complete the career requirements of her aspiration and the rest of the tasks will be completed fairly quickly, so we aren’t going to focus on them. As soon as she took the job, she jumped right up to tier 3, Funny Businesswoman. Now she is writing three comedy routines and waiting out the time until she works for her promotions. Tomas, Merry’s friend from the jungle comes to visit. They are made for each other and quickly have a solid relationship. 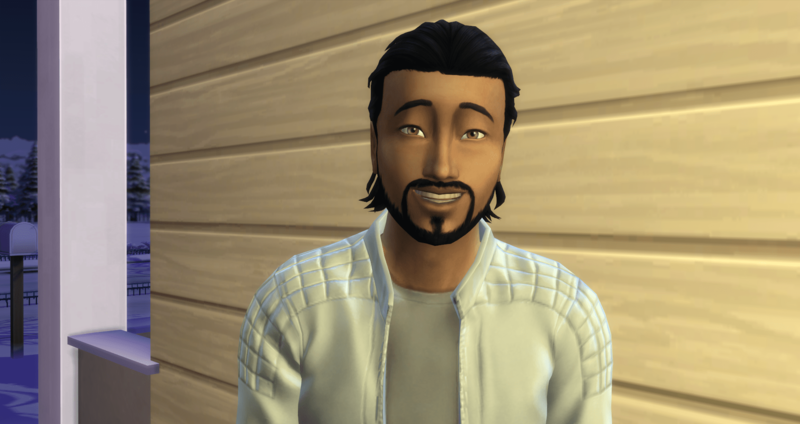 Tomas is Mean, Clumsy, and Materialistic. They get along great. I wasn’t planning on her having a relationship since this is an alternate reality but they clicked in the jungle and it just seemed like the right thing to do. At least she will be with her soul mate in one reality. Understanding that she had met her soulmate, and maybe even understanding that reality could be fleeting in this case, Merry wasted no time in proposing to Tomas. He accepted without any hesitation. 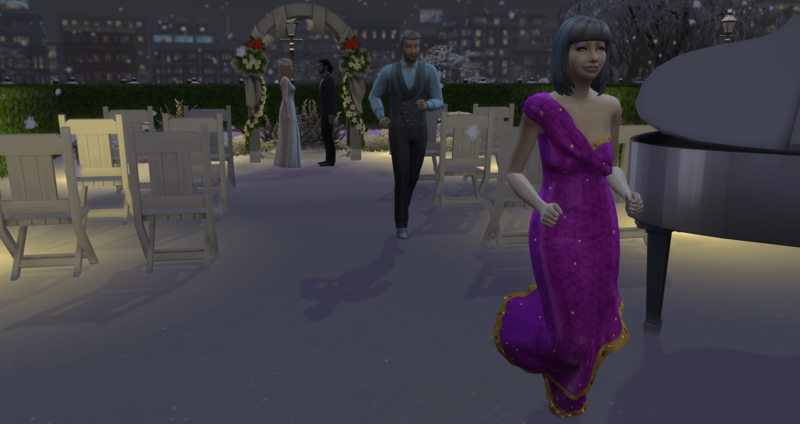 Merry wants her parents to be present at her wedding, so they plan for an immediate ceremony at the park, Myshuno Meadows, in the city. I probably should have thought about that a little bit. 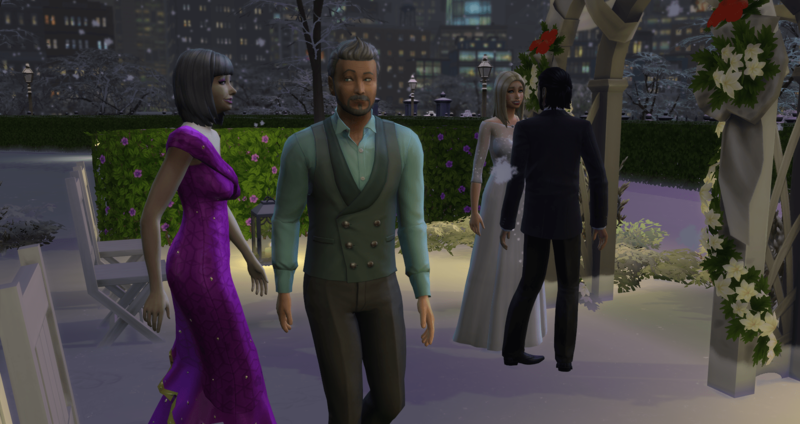 An outdoor wedding, in the winter, in formal clothing. Castor and Portia kept trying to leave. They were the smartest ones here. Merry and Tomas made it through their vows without freezing to death. Although it was close towards the end. Everyone left immediately after the ceremony, leaving the bride to trudge her way home, alone. She doesn’t look too upset though. It was a very lovely wedding, even if it was a little bit cold. Freezing the forecast said, but not a blizzard, thankfully. Tomas is questioning his life decision at the moment. His new wife might be a little crazy. He warms up quickly, though, especially when Merry suggests some horizontal activities. Soon after the wedding Merry has exciting news to share. 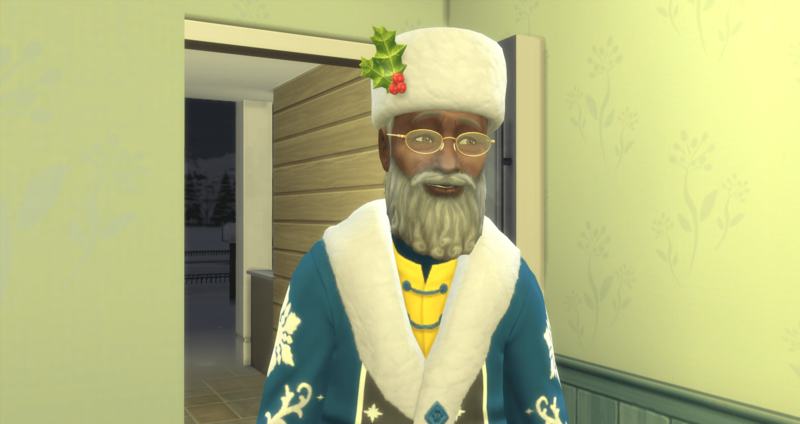 Winterfest rolls around and everyone spends a quiet holiday together. 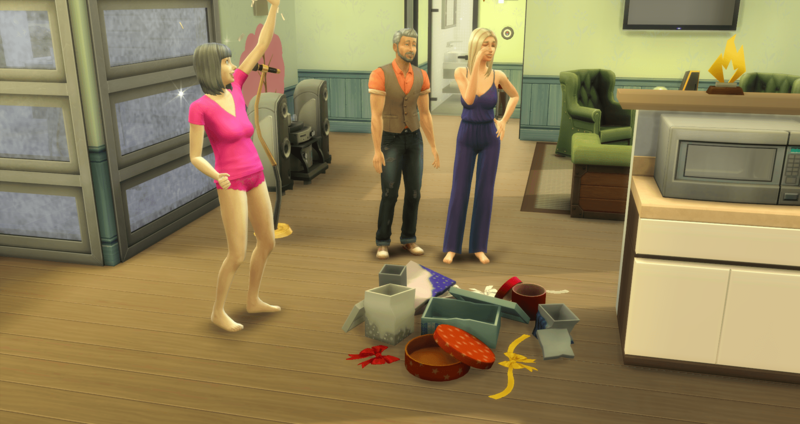 While Merry cooks a grand breakfast feast, the family opens presents. For Castor, the holiday won’t be complete until they have their feast. Now, I have never seen the pile of presents do that before. But that is cool. And you know you are done opening presents. Maybe Merry should have taken a potty break? Oh well. first everyone needs to eat breakfast, then there will be time for the showers. I sent Merry to work on Winterfest because she was close to the promotion and she was looking at a long weekend if she didn’t go. She came home with the promotion to Comedian, which bumped her up to the last tier of the aspiration. She only needed to perform three comedy routines, which took no time at all. And Joke Star was completed. 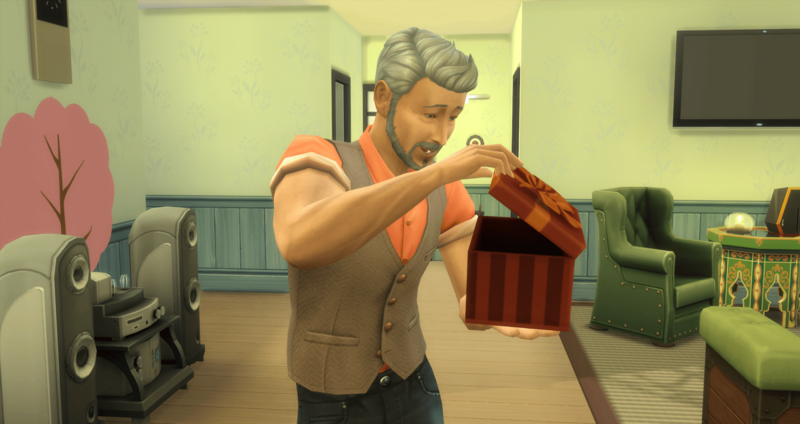 Father Winter has stopped by once more, so everyone asks for another present. Or not, I actually sent everyone to bed, and he left. 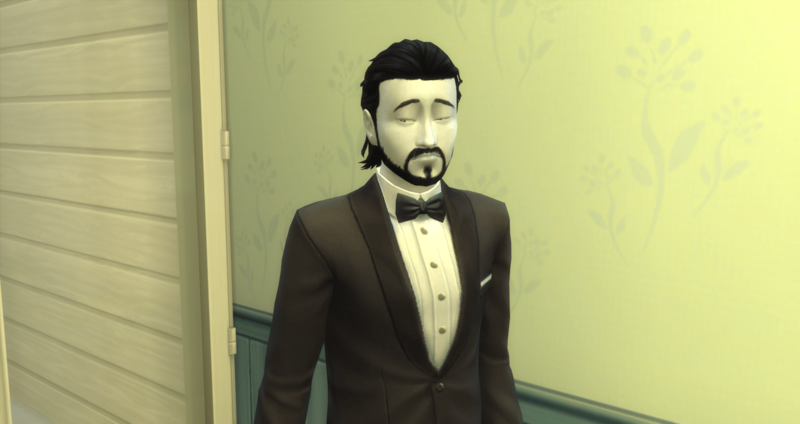 Castor missed meeting his granddaughter by mere hours. Kestra Barrera was born several hours later. She was named in honor of her grandfather. 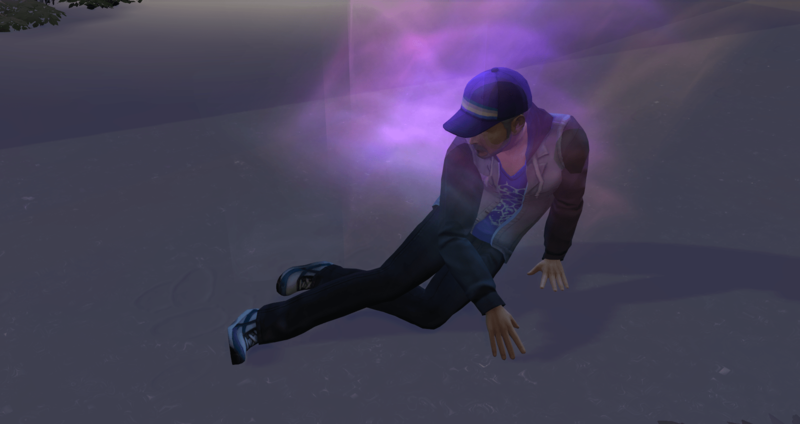 With the birth of Kestra, Merry’s brief life in an alternate reality has come to an end. 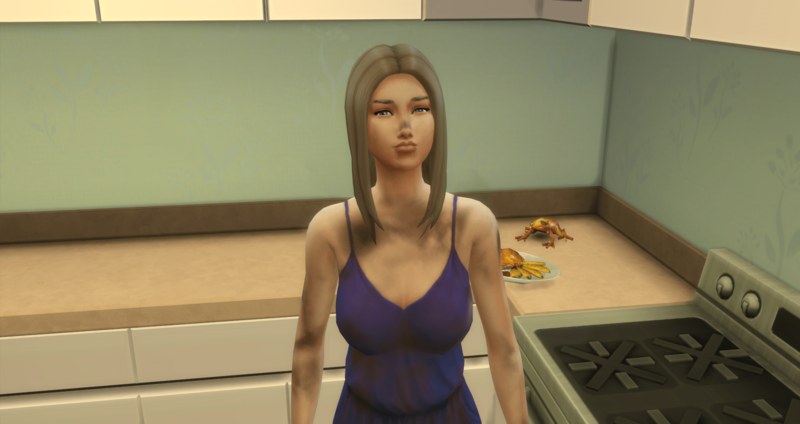 As I look forward to the 100 Baby Challenge, Merry is Mean, Perfectionist, and Hot-Headed. Her initial aspiration is to become a Joke Star giving her the bonus trait of Gregarious. She won’t be able to complete Joke Star during the challenge since she can’t have a traditional career. While I will be using the “official” rules, there may be some tweaks I make, which will be specified on the first post of the challenge.